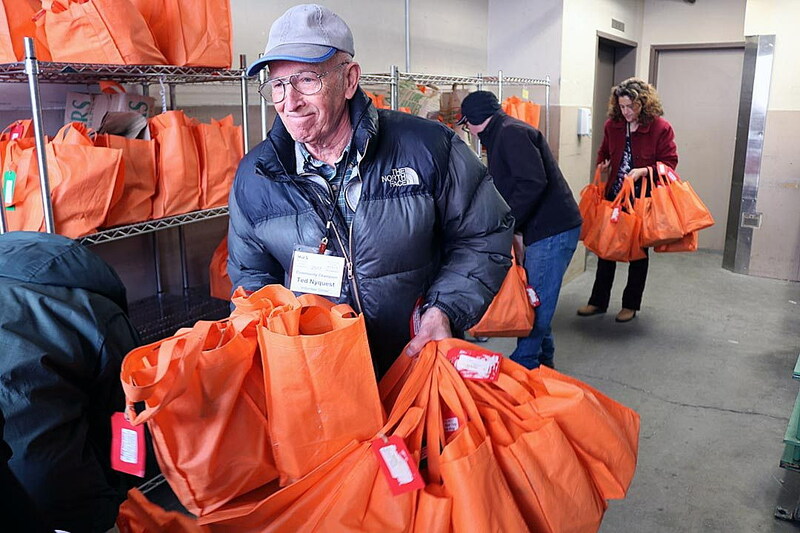 Dozens of volunteers set off into a spring storm on Thursday to deliver 290 meals to home-bound seniors and other Missoula residents who otherwise would have little to eat and no contact with the outside world. 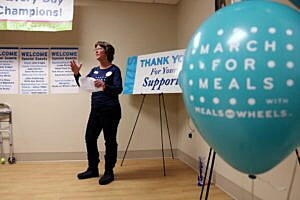 While more than 100 volunteers have done the same each day over the past year, serving 800 people with more than 100,000 meals, Thursday’s effort marked the 15th annual March for Meals event – a day in which similar programs from across the country celebrate the Meals and Wheels program. 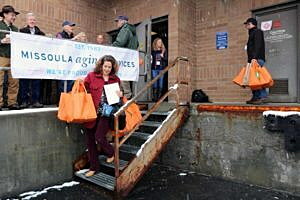 Kohler, the chief executive officer of the Missoula Aging Services, praised the program’s team of volunteers, calling them an essential link between the city’s home-bound seniors and the outside world. Each day, those volunteers pick up their route map from the Providence Center and load their vehicles with food, delivering them door-to-door to the program’s clients. They also look around the home and engage the elderly in conversation. It’s a welcome check for those who rely on the services. Thursday’s celebration brought together a long list of community leaders, including representatives for Sens. Jon Tester and Steve Daines, Mayor John Engen, city council member Julie Armstrong, and Missoula County Commissioners Jean Curtiss and Dave Strohmaier. Curtiss said the county remains a strong advocate of the program and continues to provide funding, ensuring residents outside the city limits also get the meals they need, including those who live in Condon, Seeley Lake and Potomac. Kohler said the program enables older residents and those with disabilities to maintain their independence and avoid premature placement in a nursing home. While most of the clients are over the age of 60, the program also provides services to those who have physical and mental disabilities that prevent them from preparing their own meals. On behalf of Gov. Steve Bullock, Ashley Tubbs noted that by 2030, Montana will have the third highest percentage of people over the age of 65 in the country. Programs like Meals on Wheels is vital to retaining their nutrition and overall health. Over the past few weeks, the program has come up in political debates regarding budget cuts in the 2017 state Legislature. Missoula Aging Services must raise $100,000 annually to fund the Meals on Wheels on program, though the majority of the funding comes from state and federal sources. At a Missoula rally last week, Debbie Lester of Missoula Aging services said that while the cost to feed a senior through the Meals on Wheels program stands at roughly $200 a year, it costs more than $6,000 a year to house them in nursing home. The issue of social costs and health care wasn’t overlooked by Sen. Jon Tester, who said one in four Montana seniors are living at or near poverty. Tester was represented Thursday by his field staffer Deb Frandsen.